Winemakers everywhere are discovering that pumping the juice through a Mazzei® macro aeration Wine Pump-over venturi injector during fermentation aspirates a substantial amount of air/oxygen into the liquid. Mazzei injectors are highly efficient, low cost devices for energizing fermentation. During the macro aeration process, the wine is pumped through a Mazzei venturi injector which draws in and uniformal distributes oxygen into the juice. 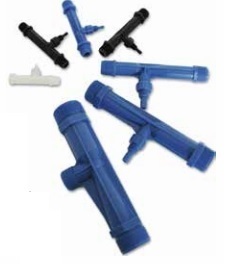 Trouble-free with no moving parts, Mazzei venturi wine pump-over injectors deliver uniform distribution. They are simple-to-use, self-priming and can run dry without problems. Superior mixing is due to Mazzei superior patented technology. Since 1978, high-efficiency Mazzei Venturi injectors have been thoroughly mixing nutrients and crop protection products into irrigation systems using the physics of flowing water to draw inputs into an irrigation stream. Mazzei injectors have no moving parts and often do not require a supplemental pump—minimizing cost and maintenance. Optimizing oxygenation during fermentation produces more consistent sensory profiles and helps stabilize color. It purges CO2 from the tank, reduces astringency and vegetation (green) characteristics, and improves the viability and efficiency of yeast. Using pump-over for macro-oxygenation also improves hydrogen sulfide (H2S) removal. That can reduce the amount of copper sulfate required in the winemaking process, lowering costs, minimizing chemical handling and safeguarding the quality of your wine. In addition to efficiently oxygenating wine during pump-over, Mazzei Venturi injectors may be used to add fining agents and other additives during racking or blending. A strong ozone solution can even be used to sanitize barrels without stripping out oak essence. Scientists at California State University, Fresno, have demonstrated that ozone concentrations of up to 10 mg/l have no significant effect on volatile aromatic compounds in oak, preserving the oak essence of vanilla, smoky and toasty notes. The Mazzei skid-mounted GDT Contacting System ensures a high concentration of ozone, optimum liquid-to-gas ratio, and thorough mixing to create a powerful sanitizing solution. In fact, no other system transfers ozone into solution faster or more effectively than Mazzei’s patented GDT Process. Traditional surface aeration systems affect only the surface levels of a wastewater pond, lagoon or basin, allowing anaerobic bacteria to proliferate beneath the surface and produce unpleasant odors. Nothing gets to the bottom of basin water treatment like the Mazzei AirJection Aeration System. The AirJection system injects a cloud of microbubbles into the lowest depths of the pond, maximizing oxygen transfer throughout the basin. And to ensure maximum impact, Mazzei uses state-of-the-art computational fluid dynamics (CFD) analysis to optimize their AirJection systems. Mazzei injectors have no moving parts, and the AirJection system can operate on just a single pump—dramatically reducing energy and maintenance costs. And most importantly, with all operating equipment located onshore, workers do not have to enter the lagoon for maintenance of the aeration system thus reducing safety risks. Wassertec are agents for Mazzei Injectors, which are made in the USA. Mazzei venturi injectors are engineered from highly chemically resistant Kynar (PVDF) and are available in sizes ranging from ½ inch to 12 inch pipe diameter. We keep stock of models in the ½ inch to 3 inch range. Other sizes are available on request.